Solution Is : A candidate secured 62% of the votes. Remaining votes = 100% - 62% Candidate is won by a margin of 144 votes. So, 162% - 38% = 144, 24% = 144 1% = 144/24, 100%=144/24*100 = 600. 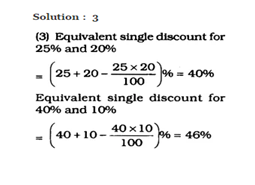 Solution Is : A seller increases the cost price of an article by 30% and fixed the marked price as Rs. 286. But during sale he gave 10% discount to the purchaser. The percentage of profit will be 17%. Solution Is : Taken cost price = 100 then loss 25% so 100-25 = 85 C.P = 100 S.P = 85 85 - 3600 100 - ? Marked price = Rs.4800.